For most of my scheduling needs I use my Google calendar because I can access that on my phone and my laptop anywhere, anytime. But sometimes it's nice to have a quick calendar reference just for dates right in front of me when I'm working at my desk. So I decided to create a simple desk calendar using the awesome new Through The Year collection by Jen Gallacher for Echo Park Paper. For the covers I cut some bare chipboard to 4x6 and adhered some of the generic patterned paper from the collection to it. I cut apart some journaling cards from the collection and added some twine and enamel dots to embellish the front cover. Then I added some foam Thickers for the year at the bottom. I found a free printable calendar online (there are a ton to chose from) and printed them on plain white cardstock. Then I added a strip of themed patterned paper to match each month. 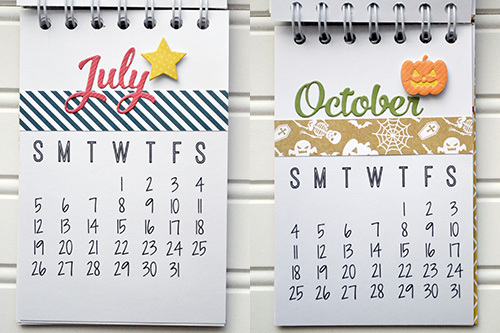 I used the coordinating Designer Dies to cut the months and an icon to match. 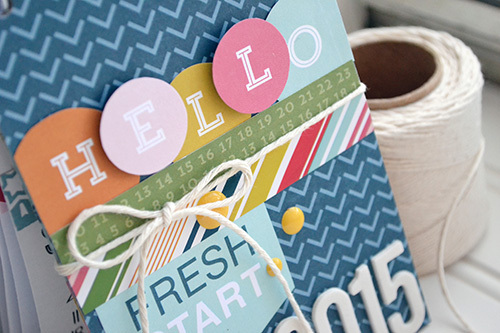 (I love the coordinating dies! They make creating easy.) Each page is the same design--simple, but perfect for what I need. I bound the covers and pages with my We R Memory Keepers Cinch tool. The calendar is sturdy enough that it stands on its own on my desk. Awesome! How about you? 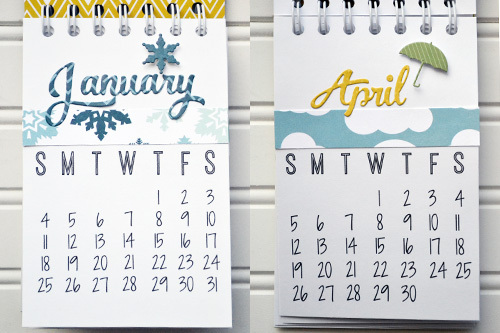 Do you prefer paper or digital calendars? 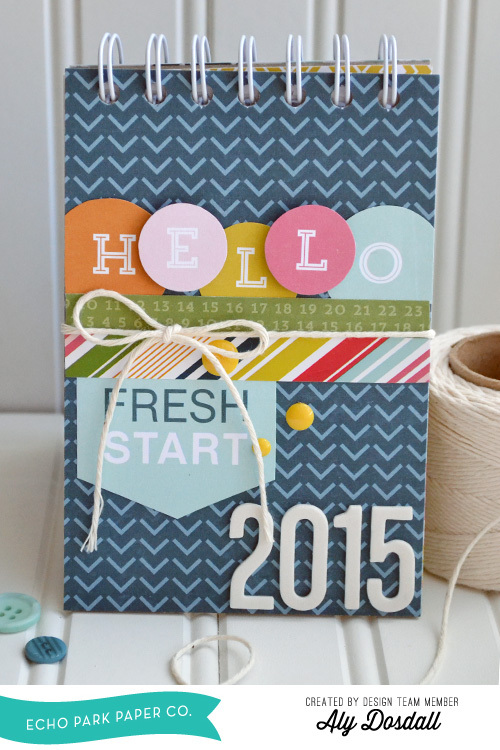 Have you made a 2015 planner or calendar? I like your calendar - that is very cool! You are so creative! :) I prefer a "paper" calendar at work and at home. This year I have the great Planner/Calendar I won from you! Thanks Again! Your calendars are so cute! Do you mind sharing what site your found the calendar planner on? Hi Bex, I believe it was from this site: http://www.cleanandscentsible.com/2014/12/free-printable-2015-desktop-calendar.html. i covered up the graphics and months at the top. hope that helps.